RDQLUS is Going Mobile… T-Mobile that is. How do I get myself into these situations?! What a RDQLUS life I live. I've had the chance in the past to work with national telecomm company T-Mobile as an independent creative consultant doing some early idea shaping and writing for some of their marketing efforts. Over the past few months I was very fortunate to have the opportunity to flex the creative muscles behind the scenes with my good friends at T-Mobile on a particularly fun project, the rollout of their new 'myTouch' mobile device. Talk about fun?! My good friend, Jen Whelan, is one hell of a creative force and project management specialist and I was honored to be a part of her very capable creative team and add anything that I could. I got a call one day that found Jen asking me if I wanted to give something new a shot. Those who know me know that the answer was first, "Hells YEAH!" and a secondly, "uh, now what is it I have to do?" One thing lead to another and I find myself at T-Mobile's Bellevue, WA headquarters filming a spot for the 'myTouch' microsite and testing my acting chops! When we've wrapped and it's time for me to go, I get an amazing added bonus: I'm given a 'myTouch' mobile device of my very own to test out! WHAAAAAAT?! Now everyone knows I have a full-on "love thang" going on with my iPhone, but who turns down tech-swag? I mean really! And I'll tell you, it's an amazing device that I carry everywhere right alongside my iPhone at all times. If you're not a member of the "cult", then you should indeed check out this little gem manufactured by HTC & offered exclusively thru T-Mobile. 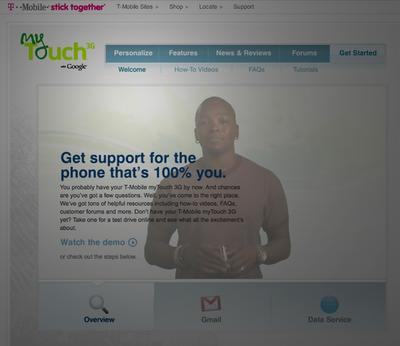 View the myTouch "micro-site".